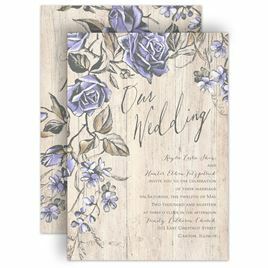 Who knew there could be so many shades of purple wedding invitations? Each hue tells a different story about your wedding day so be sure to choose the one that best suits your wedding style. Grapevine is a rich, deep purple that really captures the color's essence. Eggplant is a dark, musky purple that has an almost earthy appeal. 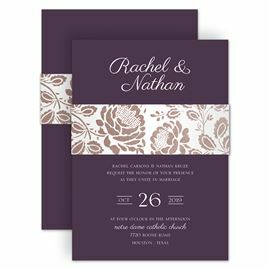 Then, of course, there are the lighter shades of orchid and lavender, perfect for spring wedding invitations or even summer wedding invites. What shade of purple suits your wedding? Whatever you choose, order a sample so you can see the color and feel the quality. Looking for ways to make the wedding experience even better for your wedding guests? 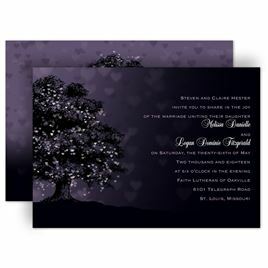 Guide them to the right ceremony and reception locations with personalized yard signs in your favorite shade of purple. 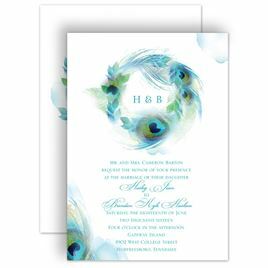 The designs are stunning and guests will be more than happy to have a little help when finding your wedding. Shop all wedding reception accessories to find helpful items for your wedding day. One of our favorites is personalized wedding napkins. The best part is you can count on all accessories from Invitations by Dawn to be stylish additions to your décor.